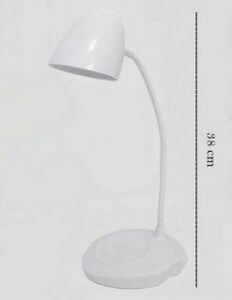 A desk light is one of the essential items that comes extremely handy when you are trying to study or use your personal computer late at night. However, there are different types of designs available, including USB powered desk lights, clamp stand desk lights, dimming desk lights, and so on. 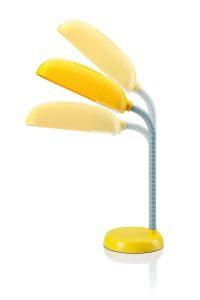 The variety of desk lights can often make the users wonder about the best suited one for themselves. 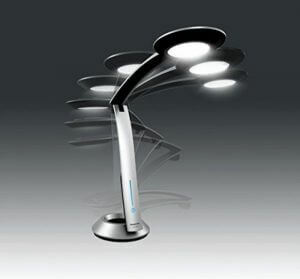 Currently, LED desk lights have become popular as they are cheap and help in electricity conservation. In this article, we will be introducing a few key points to remember when choosing the best desk light for yourself and will also compare a few top desk lights based on their prices and features so you get a better understanding on the available products before making a choice. 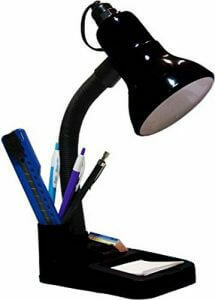 A bright desk light will help increase your work efficiency and will make it easier for you to focus on your task too. A desk light product specification involves many technical terms and numerical values which is difficult to comprehend without the proper knowledge about lighting that so many users often tend to ignore it and just focus on design or the operability. So, we would like to start by explaining the basic performance that you should consider when choosing a desk light for yourself. Recently, LED desk lights are becoming increasingly popular as they produce less heat and help in energy conservation while lasting for a long period of time. Although the price of desk lights has decreased greatly since LED desk lights have come into play, fluorescent desk lights are still the cheapest lights in the market and are often a popular choice for users who don’t go for LED desk lights. 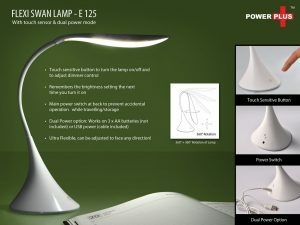 You will see a lot of technical terms in the product specification of desk lights but only four of those are of major importance to you: lm, lx, Ra, and K.
The power consumption of LED desk lights is considerably lower than that of fluorescent desk lights which is why it is impossible to compare the brightness of the two lights using watts (W), which represents the power consumption. As a result, lumen (lm) is used to represent the amount of light (total luminous flux) which is radiated from the light source in all the directions. As the value of lm increases so does the brightness of the light source. The brightness of the area when a desk light is used is known as illuminance and is displayed in the units of lux (lx). You will find that even with the same amount of illuminance, the brightness of the space decreases as the distance between the desk light and the brightened space increases. 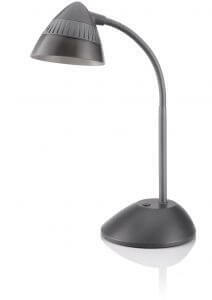 For example, if you are looking for a desk light to read then 500 lx brightness is required for comfortable reading. 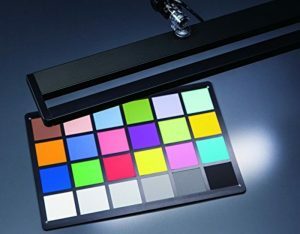 The color of the light changes as the color temperature changes and often transforms from incandescent to white to daylight white to daylight color. The color temperature is expressed in the unit of Kelvin (K) and the lower the value of K, the warmer the tone of light color can be, much like that of a candlelight. On the other hand, higher K value results in whitish and clear light. The color rendition of a light depends on the light source and the light source’s nature is known as color rendering. Basically, if the light source of your desk light is closer to the natural light then more color rendering will be considered. The color rendering value is defined by the average color rendering index (Ra) and the maximum value tends to be 100. So, if your desk light comes with a Ra of 80 or more then it will be considered as a highly natural light source with high color rendering properties to cause less eye fatigue. The angle adjustment feature and dimming feature are few of the most popular additional features on a desk light and can help the user in adjusting to their environment comfortably and easily. The dimming feature allows the user to adjust the brightness of the desk light according to their usage such as reading, working on a laptop, etc. Also, a desk light whose angle can be adjusted will make it easier to brighten an area which requires more light so that you can work comfortably when you are surrounded by people too. You also have the option to choose the installation method and the power supply type of the desk light depending on the environment. So, make sure that you check the space and usage purpose before selecting a desk light for yourself. If you want a desk light but still don’t want it to occupy a lot of desk space then a clamp type desk light is the best choice for you. However, make sure that you have enough space to attach your desk light or else you won’t be able to install your light on to the desk. 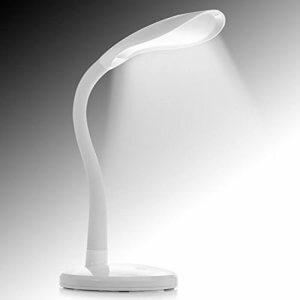 Another type of desk light is a USB powered desk light which can be attached to a laptop or plugged into an electrical outlet with the help of an adapter. Although the brightness and illuminance of the desk light will differ depending on the source of the power output, if you use a laptop to power the desk light then it will produce less and if you use an AC adaptor and electrical outlet to power it then it will produce more powerful light. It can also be easily transported and can be used anywhere which makes it highly portable and useful. Now, we will introduce the top 10 best desk lights that can be found online which will provide you with effective brightness and several other features to make the most out of it. Make sure that you pay attention to the above-mentioned points when selecting the best-suited desk light for yourself. 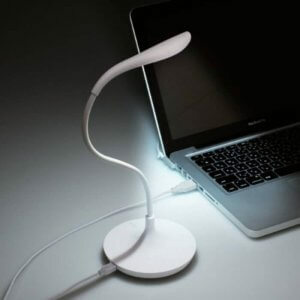 This is a flexible desk light which comes with a flexible hose and a long USB cable (55.11 inches) which makes it easy to connect to the desired power source without getting tangled. 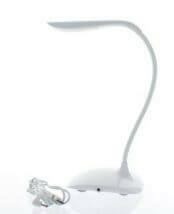 Its LED light produces a warm white color which is suited for reading or surfing on the Internet at night. It features a clip design which makes it extremely easy to attach to your keyboard or screen and makes an ideal desk light for people who use laptops at night or for traveling. However, people might find it difficult to adjust the hose of this desk light as it is not made of high-quality material and will often find it sagging in the middle while using it. Nevertheless, it is recommended for people who are always on the go. This desk light is compact and weighs only 209 grams, which makes it easily portable and perfect for people who travel a lot. It features an easy-to-push on/off switch at the base, the desk light itself is powered by AA batteries which are easy to find and purchase. Since it is cordless and lightweight, it can be taken on camping trips as well and is also recommended those who use several desks for work or study. One minor problem with this LED desk light would be that because it is battery powered, it is not as economically friendly. Especially if you carry it around a lot, you’ll also need to bring an extra set of batteries, which can be cumbersome for some people. Another effective desk light which uses fluorescent light and offers a cool and gentle light to the users, its height can be adjusted as per your convenience. This desk light offers users with a blueish white color light at 6500K which makes it good for reading or office work during the daytime. Since it comes with adjustable gooseneck, you can easily adjust it for convenience and get the light directed where you desire. This desk light is perfect for people who want a desk light on their bedside table or desk for reading, however, its switch is placed at the top near to the bulb which makes it hot, so you might feel it is difficult to turn on/off the light when needed. This corded desk light is a multi-utility desk light which can be used as a desk light or a pen/paper holder which makes it versatile and helps in saving a lot of desk space. It includes a flexible head which can be turned at various angles for the best result. 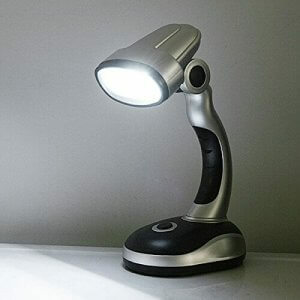 This desk light produces 300 lm of light at 5 watts which means that the LED bulb produces slightly dull light for easy and comfortable reading.However, the desk light is lightweight so one has to be careful when using it around the kids as it can easily break with a slight hand movement. 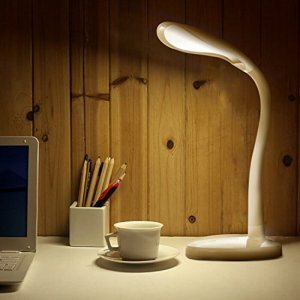 A plastic built desk lamp which comes with touch sensor switch that can be used to turn on/off the desk lamp and set the brightness level of your lamp as you desire. With this desk light, you have the option to set the brightness level of light to low, medium or high by simply touching the sensor. It produces a brightness of 90 lm so it might be slightly inconvenient to use for studying or working. The desk light provides 8 hours of light at the lowest brightness level and 4 hours at the strongest brightness level and the light starts to dim as the battery starts draining. 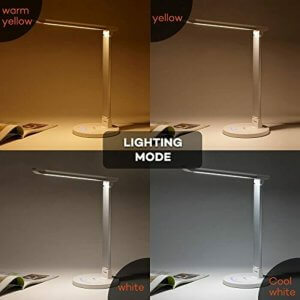 This is the perfect product for people who want to use their desk light for different needs and occasions and would require to adjust the brightness level depending on the situation like reading, traveling, surfing on Internet, etc. 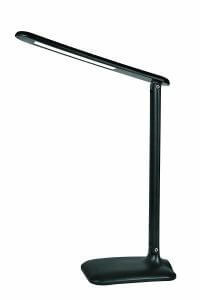 Power Plus Base 1-W Swan Plastic Desk Light is an ultra flexible LED desk light which can be adjusted at a desired angle and direction for convenience. It also features a touch sensitive buttons which can be used to not only turn on/off the desk light but also to adjust the brightness of the desk light. Also, it offers the same brightness setting to you the next time you turn on the light so you don’t have to adjust it every time. It offers users with dual power supply methods: USB power supply and Battery power supply so you can choose whichever power supply method seems more convenient to you. However, since it produces only 60 lumens of light brightness, it is not recommended for those who need a desk light with strong brightness for their work or study. 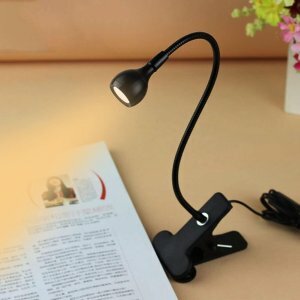 This is a compact and flexible desk light which can be easily folded, making it a good product to use on your study table or when you are traveling. This LED bulb produces 250 lumens of light and offers the user with a cool shade of bluish white light at 6500K which is closer to the color of natural daylight, making it easier to read and work. It has a modern design so placing it in your room will add a little charm to it and since it requires less space, you can put it anywhere you wish to use it. Also, it is constructed out of plastic, so it is easy to move around and carry when you are traveling. 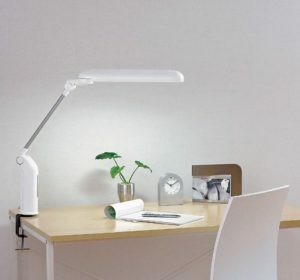 This middle-sized LED desk light has a flexible neck which allows the users to adjust the light angle as needed, making it a good product to keep on your bedside table or your reading desk for everyday use. It also features a touch sensitive on/off switch which makes it easy to power the light and includes a charging indicator so that you know when it needs to be recharged again. Since it weighs just 281g and it is powered by both battery and USB power supply, you can easily carry it with you while traveling without having to worry about a power source. Philips LED Cap Desk Light 4.5W is one of the top best desk lights as it not only helps in saving energy but is extremely safe to use. It doesn’t produce as much thermal emission as other desk lights which helps in maintaining a cool atmosphere. It includes higher color rendering (up to 80) so users can stay focused on reducing the eye fatigue. It ensures that the light doesn’t glare or reflection to the user’s eye so that it can be used comfortably for long hours. The Philips LED Desk Light produces 450 lumens of brightness and expands the LED bulb’s life by controlling the heat produced by the desk light. This is undoubtedly one of the best desk lights in the market which is perfect for people who study or work for long hours sitting on their desk or study table. 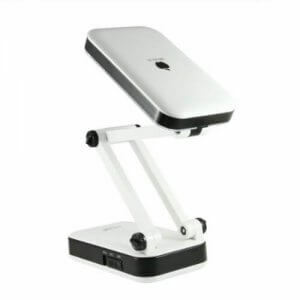 This is a small and lightweight desk light which is easily foldable making it an ideal product for use when you are traveling frequently. It is a battery operated desk light whose batteries can be easily recharged and is built out of plastic which makes it lightweight. It provides the user with brightness setting so that they can choose the desired brightness for their environment. Since this handy desk light weighs just 290 grams and offers different brightness settings, it is recommended as a reading light for study tables and while traveling. This is one of the most cost-effective desk light in Amazon. If you need a desk light for casual use, why don’t you give it a try? So, did you like our recommended desk lights? A good desk light will not only make it easy for you to read and work but will also reduce the light strain on your eyes so that you can use it for a longer period of time. It is important to consider the brightness, illuminance, and other important points that are mentioned above while choosing the best desk light for your needs.